Olivia is our very first livernosed puppy, she has been a delight to live with (although very mischievous). She has done herself proud in the showring. She has gained her title with some great wins along the way. 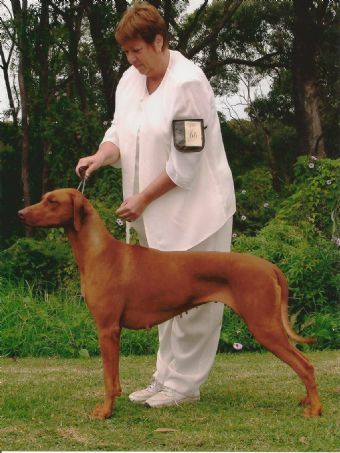 Olivia has been awarded BEST EHIBIT IN SHOW (ALL BREEDS), MULTI RUNNER UP BEST IN SHOW (ALL BREEDS), Best gaited at the 2009 QLD specialty, Best head at 2011 NSW specialty RRc Inc, multiple best exhibit in group, runners up in group as well as classes in group and in show. 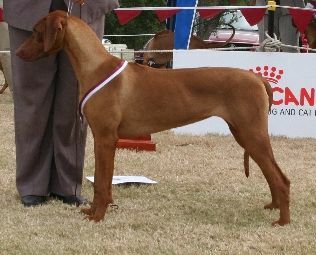 Olivia gained her GRAND CHAMPIONSHIP title with ease. 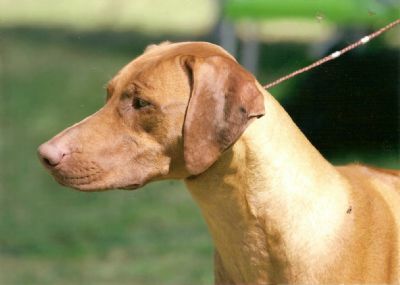 (there are only a very small handful of livernosed ridgebacks to have done this and even fewer that have won an all breeds Best in Show) She placed 3rd at the 2006 national out of a class of 15. Her critique read: Good dentition, correct livernose, good angles, moves true. As time goes by Olivia enjoys her showing even more. Her will to please never ceases to amaze us. Olivia won her Veteran class 7 - 10 at the 2013 RRCI show.